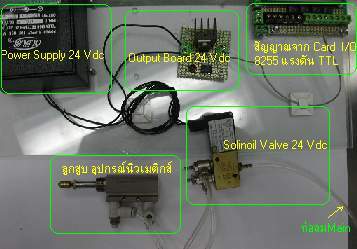 In industrial where use Automation System for process the product that get computer system to common with PLC,Microcontroller,Driver&Indexer Steppermoter for control to equipment and device processing such as motor,Relay,Solinoil Valve. In mechanic will use pneumatic to control system of machine.This project should be the basic in computer control Pneumatic system . 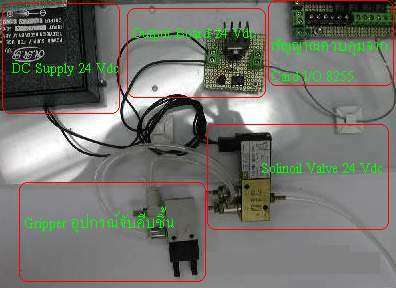 from picture,I use signal from Card I/O 8255 that has TTL 5 Vdc. which control signal with Program Computer to Opto at Output Board that process like switch distribute 24 Vdc. to Solinoil Valve which is Coil for control ON-Off air valve in drive cylinder or Gripper . 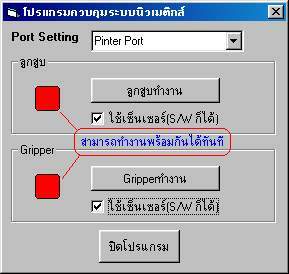 all this we can take sensor device such as sensor,switch addition for send input signal to Card I/O 8255 that program will get for condition in process which program to control device . 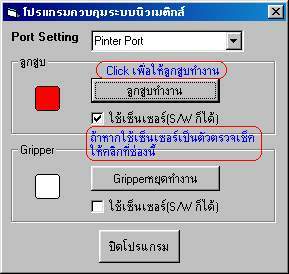 Click"ลูกสูบทำงาน" after the button caption will change to "ลูกสูบหยุดทำงาน" we can use sensor for Input signal in checking codition of program by select check box"ใช้เซ็นเซอร์"
2) To know for prefer Pneumatic device.